I have been trying different varieties of biscuits which are tasty and also healthy. 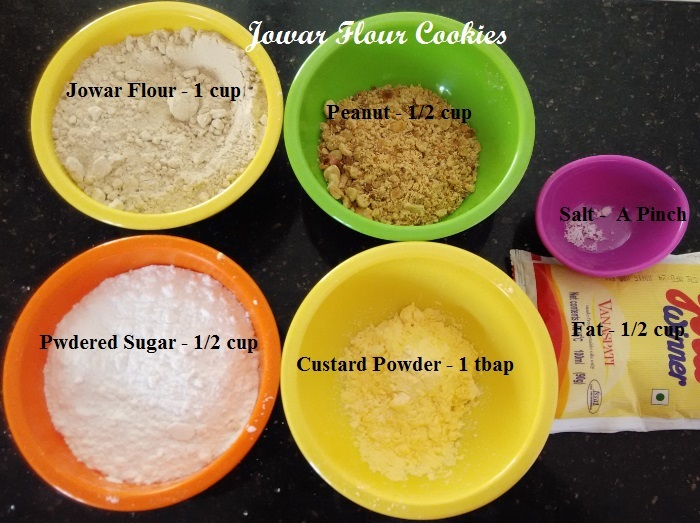 In this recipe, I have tried Jowar millet and Peanut both of which are good for health. Both are also very soft as well. Another good aspect of this cookies is that it is totally gluten free. The Biscuits came out well and was liked by my family. 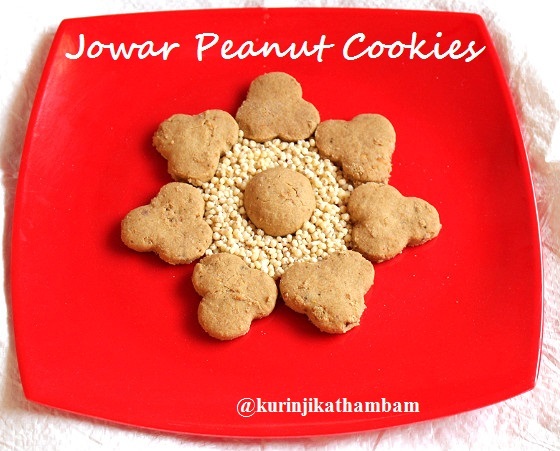 Click here for more Jowar Recipes. Click here for more COOKIES Recipes. 1. 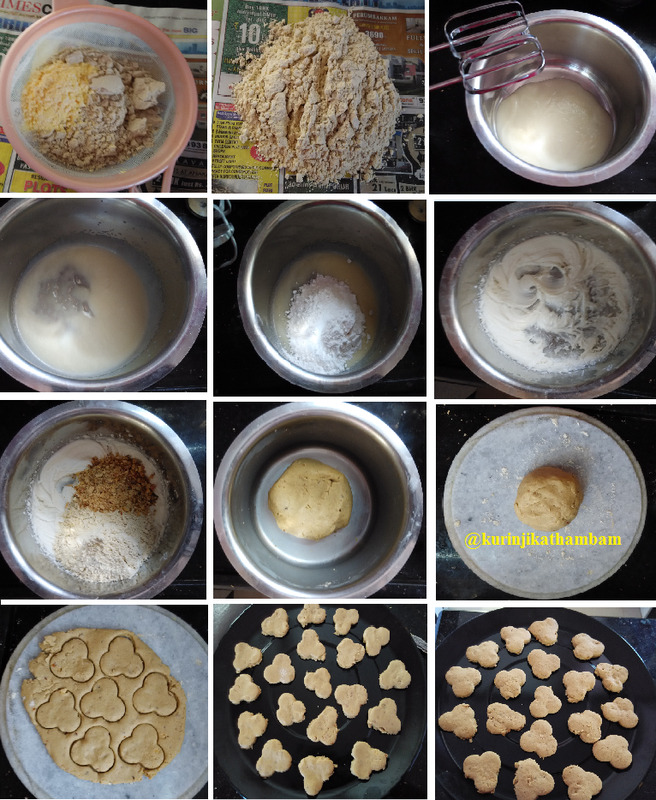 Sieve the Jowar flour and custard powder together for 2 times. Keep it aside. 2. Coarsely powder the (80%) peanut without skin using the dry mixie. Just pulse 3-4 times only. 3. Preheat the oven for 200 degree Celsius for 10 mins. 4. Cream the butter / dalda / fat using the electric beater or with your fingers till it becomes fluffy and soft. 5. Add the powdered sugar and salt with the creamed fat. Again beat till this mixture becomes soft. 6. Now add the flour mixture (from 1 ) and peanut powder (from 2). Mix them well and knead it into a soft and pliable dough. 7. Then roll the dough into ¼ inch thickness using the rolling pin on the flat surface like table top or rolling board. 8. Then cut the rolled dough into your desired shape using the cookie cutter or bottle cap. 9. Now arrange them on the baking tray and bake it for 12 mins at 180 degree Celsius. No need to grease the baking tray. 10. Allow it to cool down and store it in a air tight continer. Enjoy this gluten free and tasty cookies with tea. 1. I used dalda/vanaspathi, but you can use buter also. 2. Custard powder is optional. 3. No need to add milk or water to make a dough. Wishing a Happy Deepavali !! !